Soft tissue healing is defined as the replacement of destroyed tissue by living tissue in the body. This process consists of two parts - regeneration and repair. During the regeneration component, specialized tissue is replaced by the proliferation of surrounding undamaged specialized cells. In the repair component, lost tissue is replaced b granulation tissue which matures into scar tissue. The different healing phases is not mutually exclusive and tend to overlap quite a lot. Short phase immediately after injury, lasting about 6-8 hours, and up to 24 hours after a crush injury. The time of the bleeding will depend on the extend of the soft tissue injury and the management thereof. The more vascular the injured structures, the more bleeding will occur. The goal of the inflammation phase is to stop the bleeding phase. This is achieved by vasoconstriction, retraction of injured blood vessels, fibrin deposition and clotting. The blood supply to the area increases in this time, causing oedema and redness. This phase starts rapidly within a 6-8 hours after the soft tissue injury, reaches the maximal reaction between 1-3 days and gradually resolves in a few weeks. Phagocytosis also happens during this phase. The acute inflammatory involves activities that generate exudates - plasma-like fluid that exudes out of tissue or its capillaries and is composed of protein and granular leukocytes (white blood cells). Chronic inflammatory response is of prolonged duration and involves the presence of nongranular leukocytes and the production of scar tissue. Local vasoconstriction occurs, lasting a few seconds to as long as 10 min. Larger vessels constrict due to neurotransmitters and capillaries and smaller arterioles and venules constrict due to the influence of serotonin and catecholamines released from platelets. The resulting reduction in the volume of blood flow in the region promotes increased blood viscosity or resistance to the flow, which further reduces blood loss at the injury site. The platelet reaction provokes clotting as individual cells irreversibly combine with each other and with fibrin to form a mechanical plug that occludes the end of a ruptured blood vessel. The platelets also produce an array of chemical mediators in the inflammatory phase: serotonin, adrenaline, noradrenaline, and histamine. Also ATP is use for energy in the healing process. Fibrinogen molecules are converted into fibrin for clot formation through two different pathways. Following vasoconstriction, vasodilation is brought on by a local axon reflex and the complement and kinin cascades, approximately 20 proteins that normally circulate in the blood in inactive form become active to promote variety of activities essential for healing. Phagocytosis- is the activation of neutrophils and macrophages to rid the injured site debris and infectious agents. As the blood flows to the injured area slows, these cells are redistributed to the periphery, where they begin to adhere to the endothelial lining. Mast cells and basophils are also stimulated to release histamine, further promoting vasodilatation. Bradykinin also promotes vasodilation and increase blood vessel wall permeability, contributing to the formation of tissue exudates. Approximately 1 hour post-injury, swelling, or edema, occurs as the vascular walls become more permeable and increased pressure within the vessels forces a plasma exudate out into the interstitial tissues. These only happen for a few minutes in cases of mild trauma, with a return to normal permeability in 20-30 minutes. More severe traumas can results in a prolonged state of increased permeability, and sometimes result in delayed onset of increased permeability, with swelling not apparent until some time has elapsed since the original injury. Mast cells are connective tissue cells that carry heparin, which prolongs clotting and histamine. Platelets and basophil leukocytes also transport histamine, which serves as a vasodilator and increases blood vessel permeability. Bradykinin, a major plasma protease present during inflammation, increases vessel permeability and stimulates nerve endings to cause pain. During this phase, collagen is produced to form scar tissue. This phase starts between 24-48 hours after injury, but lasts up to 2-3 weeks, when the bulk of the scar tissue is formed. Revascuarisation and fibroblast migration happens during this phase. The process begins within hours of tissue injury. 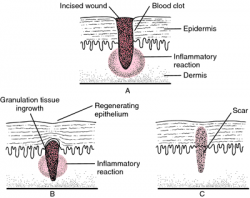 Epidermal cells at the wound edges undergo structural changes, allowing them to detach from their connections to other epidermal cells and to their basement membrane. Intracellular actin microfilaments are formed, allowing the epidermal cells to creep across the wound surface. As the cells migrate, they dissect the wound and separate the overlying eschar from the underlying viable tissue. Wounds in a moist environment demonstrate a faster and more direct course of epithelialization. Occlusive and semiocclusive dressings applied in the first 48 hours after injury may maintain tissue humidity and optimize epithelialization. The fibroblast is a critical component of granulation tissue. Fibroblasts are responsible for the production of collagen, elastin, fibronectin, glycosaminoglycans, and proteases. Fibroblasts grow in the wound as the number of inflammation cells decrease. The demand for inflammation disappears as the chemotactic factors that call inflammatory cells to the wound are no longer produced and as those already present in the wound are inactivated. A rich blood supply is vital to sustain newly formed tissue and is appreciated in the erythema of a newly formed scar. The macrophage is essential to the stimulation of angiogenesis and produces macrophage-derived angiogenic factor in response to low tissue oxygenation. This factor functions as a chemo-attractant for endothelial cells. Basic fibroblast growth factor secreted by the macrophage and vascular endothelial growth factor secreted by the epidermal cell are also important to angiogenesis. Contraction results in a decrease in wound size, appreciated from end to end along an incision; a 2-cm incision may measure 1.8cm after contraction. The maximal rate of contraction is 0.75 mm/d and depends on the degree of tissue laxity and shape of the wound. Loose tissues contract more than tissues with poor laxity, and square wounds tend to contract more than circular wounds. Wound contraction depends on the myofibroblast located at the periphery of the wound, its connection to components of the extracellular matrix, and myofibroblast proliferation. The remodeling phase starts around the peak of the proliferation phase. The result of this phase is an organised, quality and functional scar similar to the tissue it is busy repairing. The ultimate endpoint following remodeling depends on the tissue type. In non-central nervous system (CNS) tissue that undergoes primary healing, very little remodeling occurs because of the lack of extra-cellular matrix produced during repair. Secondary healing, in contrast, involves fiber alignment and contraction to reduce the wound size and to reestablish tissue strength. Complete recovery of original tissue strength is rarely obtained in secondary healing because repaired tissue remains less organized than non-injured tissue, which results in scar formation. Collagen-rich scars are characterized morphologically by a lack of specific organization of cellular and matrix elements that comprise the surrounding uninjured tissue. In CNS tissue where there is no repair or regeneration of injured neurons, there is also relatively little reestablishment of structural integrity in the region. Instead, during CNS remodeling, the glial scar around the lesion becomes denser as astrocytic processes become more intertwined and more or less isolates but does not repair the injured region. Remodeling in the CNS is limited, because of the need to protect the CNS from the body’s robust inflammatory responses, reactive astrocytic processes become further intertwined, forming a dense sheath around the wound site . Restoration of continuity occurs directly by fibrous adhesion, without formation of granulation tissue; it results in a thin scar. Wound healing occurs by union by adhesion of granulating surfaces, when the edges of the wound are far apart and cannot be brought together. Granulations form from the base and sides of the wound toward the surface. 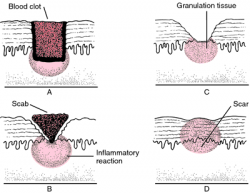 Wound healing occurs by the gradual filling of a wound cavity by granulations and a cicatrix. This classification is based on a treatment protocol of Clanton et al., but it is similar to other classifications. It is possible that some phases overlap, dependable on the individual response to healing and the type of injury. Not every patient undergoes all phases to achieve a full rehabilitation. Goal: Minimize inflammation and pain. This phase starts when signs of inflammation begin to reduce. Inflammation signs are heat, swelling, redness and pain. Goal: Return to sport without re-injury. Increase their strength, endurance, speed, agility, flexibility and proprioception until the normal values of patient. Soft tissue healing is a natural process that occurs in the body after an injury. This process happens without the need for medication and therapy, but this can play an important role in cases where problems are identified in this natural process, such as repeated trauma, inhibited response or delayed reactions. The aim would then be to facilitate and stimulate the soft tissue healing process. It is also important to realise that inappropriate therapy will inhibit these events. It is thus very important to be selective of the most appropriate therapy at each stage. ↑ Walter JB, Israel MS. General Pathology, Churchill Livingstone. Six. Ed., Edinburg. 1987:151-3. ↑ 2.0 2.1 2.2 2.3 2.4 2.5 2.6 2.7 2.8 Electrotherapy on the web. Soft Tissue Repair and Healing Review. Available from http://www.electrotherapy.org/modality/soft-tissue-repair-and-healing-review (accessed 20/02/2019). ↑ 3.0 3.1 3.2 3.3 Pasadena. Soft tissue healing. Available from www.pasadena.edu/files/syllabi/rxaguilar_11913.doc soft tissue healing (accessed 28/02/2019). ↑ 4.00 4.01 4.02 4.03 4.04 4.05 4.06 4.07 4.08 4.09 4.10 4.11 4.12 Medscape. Simon, PE. Skin Wound Healing. Available from: https://emedicine.medscape.com/article/884594-overview (accessed 28/02/2019). ↑ 5.0 5.1 5.2 Medical dictionary. Healing by first intention. Available from: http://medical-dictionary.thefreedictionary.com/healing+by+first+intention (accessed 28/02/2019). ↑ Arnheim DD. Essentials of athletic training. St Louis: CV Mosby Co. 1995. ↑ Sherry MA, Best TM. A comparison of 2 rehabilitation programs in the treatment of acute hamstring strains. Journal of Orthopaedic & Sports Physical Therapy 2004;34(3):116-25.